The Barracuda BOP (Blow Out Protection) is an application specific rig-floor computer with integrated features required in blowout preventer surface systems. This workstation has a 19 inch LCD display large enough to clearly display in one screen, all the critical information such as the complete Christmas tree, thereby avoiding the need to toggle between two screens. The Azonix Drilling Unit is an application specific tool for use in the oil and gas industry. It is a mission critical device during the drilling process. The ADU is used in Zone 1 related hazardous areas exposed to the rig floor environment. When rigs are drilling in any other direction besides straight down, the Azonix Drilling Unit (ADU) is mandatory. Directional drilling services enable the rig operator to navigate the down hole bit to the reservoir target. The Barracuda excels in Military C4 applications and oil and gas exploration, where a display or workstation must be able to withstand harsh shock and vibration or other rugged environmental factors. The system's small footprint and VESA hole pattern allows for easy mounting in space-constrained work areas, making it equally suitable for use in automation environments where a standalone system must be mountable to various surfaces, from a standard pedestal to a boom, pole or custom panel mounting. 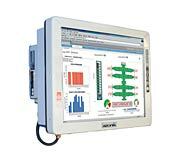 The ProPanel® MP2100 Computer System is designed for mission-critical applications in hazardous environments. 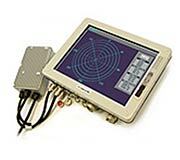 TheMP2100 is a fourth-generation rig floor instrumentation computer system, utilizing core technologies field-proven in oil exploration, mud flow control, and other hazardous and rugged Zone 2, Class 1 Division 2 environments. The system displays real-time information using standard PC architecture with glass-on-glass capacitive touch-screen and programmable keypad. The TC2100 is an extension to the Azonix ProPanel® Thin Client product line, and is based on the same architecture as the TC2500. 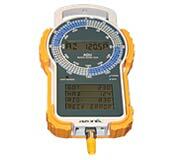 The TC2100 has a larger 15" LCD screen and higher resolution, to be able to display more information. Targeted at MWD/LWD, mud logging and data-rich applications in Zone 1 areas, this rugged Thin Client version has additional optional features such as larger Flash memory capacity, optical Ethernet and an integrated Ethernet hub for wireless networking.